Kick off your visit on the 28th (Sun): admire the natural beauty at The Huntington Library, Art Collections and Botanical Gardens, take a stroll through Angelino Heights Historic Area, then get to know the fascinating history of Hollywood Walk of Fame, and finally take a leisurely stroll along Santa Monica Pier. Plan my day in Los Angeles using traveler tips and tourist information provided by Inspirock. Frankfurt, Germany to Los Angeles is an approximately 15-hour flight. You can also do a combination of train and flight; or do a combination of flight and bus. The time zone difference moving from Central European Time to Pacific Standard Time is minus 9 hours. Expect somewhat warmer temperatures when traveling from Frankfurt in April; daily highs in Los Angeles reach 28°C and lows reach 15°C. Finish your sightseeing early on the 28th (Sun) so you can travel to Las Vegas. On the 29th (Mon), examine the collection at The Mob Museum, then get a taste of the local shopping with The Strip, and then ponder the design of Bellagio Fountains. 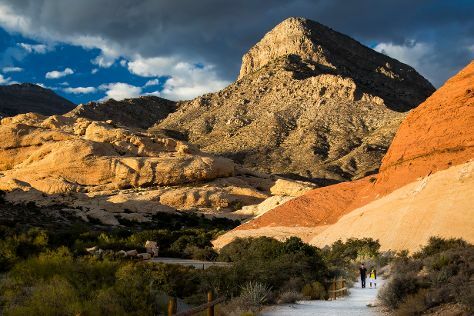 Keep things going the next day: identify plant and animal life at Lake Mead National Recreation Area and then take in breathtaking views at Red Rock Canyon National Conservation Area. To see maps and other tourist information, go to the Las Vegas tour itinerary planning website . You can fly from Los Angeles to Las Vegas in 4 hours. Other options are to drive; or take a bus. In April, daily temperatures in Las Vegas can reach 31°C, while at night they dip to 16°C. Cap off your sightseeing on the 30th (Tue) early enough to travel to Grand Canyon National Park. Start off your visit on the 1st (Wed): take some stellar pictures from Lookout Studio, then examine the collection at Kolb Studio, then take in breathtaking views at Grand Canyon South Rim, and finally explore the stunning scenery at Yavapai Point. For traveler tips, more things to do, ratings, and more tourist information, use the Grand Canyon National Park trip itinerary maker . You can do a combination of car and flight from Las Vegas to Grand Canyon National Park in 4.5 hours. Alternatively, you can drive; or take a shuttle. The time zone changes from Pacific Standard Time (PST) to Mountain Standard Time (MST), which is usually a 1 hour difference. Traveling from Las Vegas in May, you will find days in Grand Canyon National Park are a bit cooler (23°C), and nights are colder (0°C). Finish your sightseeing early on the 1st (Wed) to allow enough time to drive to Death Valley National Park. Kick off your visit on the 2nd (Thu): don't miss a visit to Ashford Mill Ruins, steep yourself in history at Eureka Mine, then explore the stunning scenery at Twenty Mule Team Canyon, and finally explore the stunning scenery at Mosaic Canyon. To see where to stay, other places to visit, reviews, and tourist information, go to the Death Valley National Park trip itinerary tool . Getting from Grand Canyon National Park to Death Valley National Park by car takes about 7 hours. The time zone changes from Mountain Standard Time to Pacific Standard Time, which is usually a -1 hour difference. While traveling from Grand Canyon National Park, expect somewhat warmer days and much hotter nights in Death Valley National Park, ranging from highs of 33°C to lows of 15°C. Cap off your sightseeing on the 2nd (Thu) early enough to go by car to Sequoia and Kings Canyon National Park. On the 3rd (Fri), trek along Big Stump Basin and then admire the sheer force of Roaring River Falls. For reviews, more things to do, and other tourist information, refer to the Sequoia and Kings Canyon National Park trip itinerary planner. Drive from Death Valley National Park to Sequoia and Kings Canyon National Park in 7 hours. In May, daytime highs in Sequoia and Kings Canyon National Park are 34°C, while nighttime lows are 15°C. Finish your sightseeing early on the 3rd (Fri) to allow enough time to take a bus to Yosemite National Park. 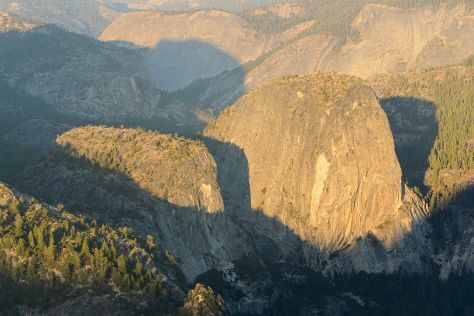 On the 4th (Sat), take in the dramatic scenery at Yosemite Falls, then take in the dramatic scenery at Vernal Fall, then trek along Panorama Trail, and finally take in the dramatic natural features at Glacier Point. To see traveler tips, where to stay, reviews, and more tourist information, read Yosemite National Park route maker tool . You can take a bus from Sequoia and Kings Canyon National Park to Yosemite National Park in 7 hours. When traveling from Sequoia and Kings Canyon National Park in May, plan for slightly colder days and colder nights in Yosemite National Park: temperatures range from 21°C by day to 1°C at night. On the 5th (Sun), you're off toSan Francisco. On the 5th (Sun), head off the coast to Alcatraz Island. For ratings, more things to do, traveler tips, and other tourist information, you can read our San Francisco trip itinerary builder app . You can drive from Yosemite National Park to San Francisco in 4 hours. Alternatively, you can do a combination of car and flight; or do a combination of bus and flight. Expect a bit warmer evenings in San Francisco when traveling from Yosemite National Park in May, with lows around 13°C. Cap off your sightseeing on the 6th (Mon) early enough to travel back home.